Trust me: Aubergine Salad is not pretty but it is delicious, nutritious, and oh-so-easy to prepare. My husband attended high school in Turkey under the AFS Intercultural Programs and has retained not only an understanding of the language of his host family but also a weakness for Ottoman cuisine. I’ve been seduced by that country’s culinary traditions too, especially any dish made with eggplants, aka aubergines. Flipping through a 1950s British cookery book yesterday I found a recipe for aubergine salad, which is known as patlican salatsi in Turkey and more familiarly as baba ghanoush elsewhere. Since the authors of Plats du Jour, or Foreign Food (Penguin Books, 1958) explained that their charmingly illustrated compilation of recipes from lands far and wide was “not intended as an armchair cookery book” but instead was “designed for action in the kitchen,” I decided to honour that admonishment and get up and get busy. Good thing I did too, because a late-afternoon snack of aubergine salad served with crisp flatbread was exactly what my tastebuds required. This recipe is all about proportions, so use as many eggplants as you feel necessary, based on the crowd expected. Since we are only three—me, my husband, and our daughter—I used two large eggplants, which made about 2-1/2 cups of this tasty dip. Leave the aubergines whole and bake them in a moderate [350 degrees Fahrenheit] oven until they are quite soft. [NOTE: I cut the aubergines in half and brushed the cut side with olive oil before placing in the oven.] Then cut each one in half and scoop out the soft pulp, discarding the skins. Put the pulp into a bowl with some very finely chopped raw shallot, a little salt, and some black pepper, blend in sufficient lemon juice and 2 tablespoonfuls of olive oil. Put the salad in a cold place and stir it well before it is served with crisp bread or toast. 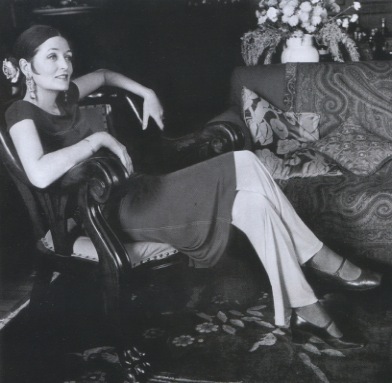 From the Age of Aquarius to the druggy days of disco, Maxime de La Falaise (1922-2009, shown above) wrote a lively cookery column for American Vogue. Fashion designer, writer, former model, daughter of a celebrated British portrait painter, and ex-wife of a French count, she was a spirited Anglo-Irish beauty who became a high priestess of the international bohemian set. She appeared in Andy Warhol films, had affairs with Surrealist artist Max Ernst and British diplomat Duff Cooper, and posed for Cecil Beaton. La Falaise could cook up a storm too, and tales of her culinary triumphs (as well her social debaucheries) have been passed on to me by a few of her friends. In the 1 September 1972 issue of Vogue La Falaise addressed the topic “How to be a Good Cook … Without Really Slaving.” The centerpiece of the featured menu was Herbed Roast Chicken Legs. 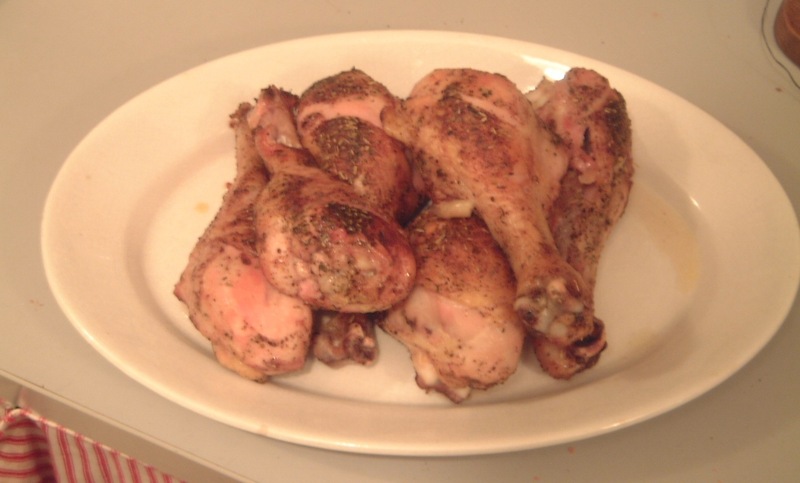 Last night our cupboard was pretty bare but we did possess most of the ingredients outlined in the lady’s brief recipe—chicken legs, herbes de Provence, salt, pepper, and olive oil. No cardamom, alas; turns out we used it up making a curry last week. A few seconds’ worth of Internet sleuthing, however, turned up one cook’s reasonable facsimile of this fragrant Asian spice—she conjured a mock version by mixing equal amounts cinnamon, nutmeg, coriander, and ginger, all of which we have. Chicken is pretty much a vehicle for other flavours, in any case, and as my family observed after cleaning their plates, La Falaise’s herbed drumsticks did not disappoint, cardamom or no cardamom. On the side I served mushrooms cooked in cream, a splash of white wine, and sprinkled with chopped parsley. Butter a shallow casserole, arrange the chicken legs in one layer. Brush them well with part of the olive oil. Sprinkle with half the herbs and cardamom and season with salt and pepper. Immediately turn the legs over, brush on the remaining oil, and repeat seasoning. Mrs Gibson's Egg Dish, one of decorating doyenne Nancy Lancaster's favourite family recipes. 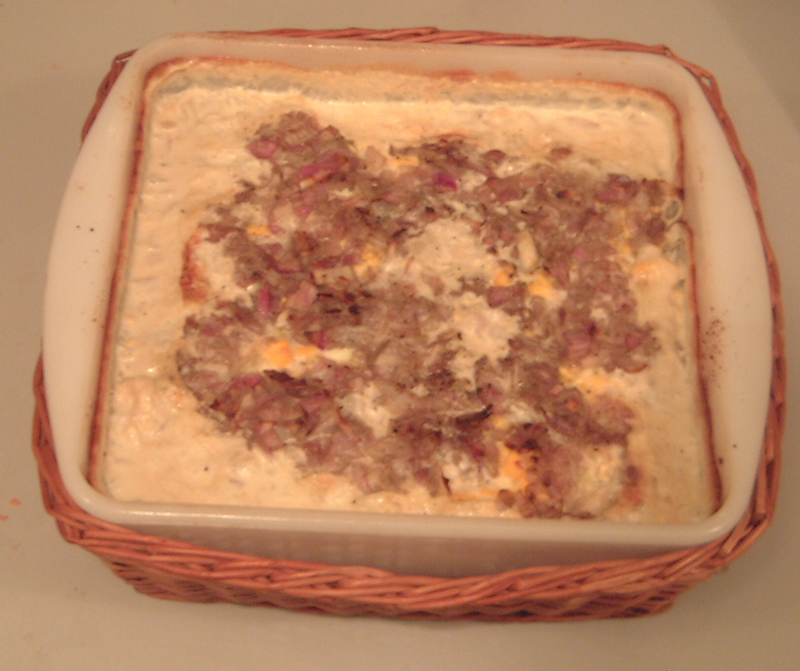 A baked mixture of eggs, onions, and cream, it has a casserole-like texture. When Virginia-born tastemaker Nancy Lancaster (1897-1994) moved to England in the 1920s as wife of aspiring politician and Marshall Field department-store heir Ronald Tree, she brought in her luggage a plethora of family recipes. 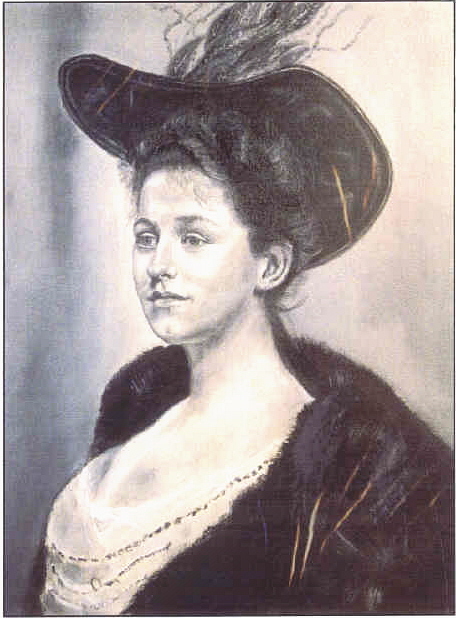 Whether Lancaster, owner of the august decorating firm Sibyl Colefax & John Fowler, was entertaining at Ditchley Park, Kelmarsh Hall, or Haseley Court—to name just three of her celebrated residences—the menu frequently featured a plainly named accompaniment called Mrs Gibson’s Egg Dish, a creamy comfort food that was a specialty of her aunt Irene Langhorne Gibson, the wife of artist Charles Dana Gibson. Preheat oven to 400 degrees Fahrenheit and butter a medium-size baking dish. Finely chop the onions and then sauté them in butter until they are limp and golden. Separate egg whites and egg yolks. [Break up the whites into pieces and gently crumble the yolks with your hands.] 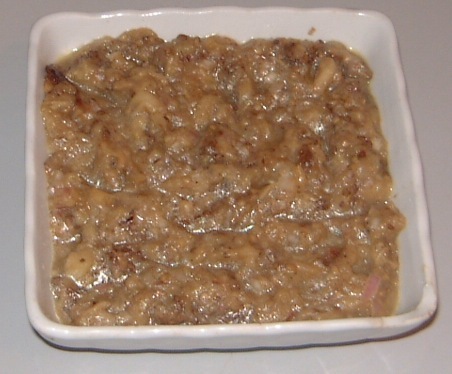 In the buttered baking dish, place a layer of bread crumbs, a layer of whites, a layer of yolks, a layer of onions, salt, and pepper, until dish is filled. Add enough cream to fill the dish [which means to the top of the ingredients, more or less]. Place in oven until done and browned. 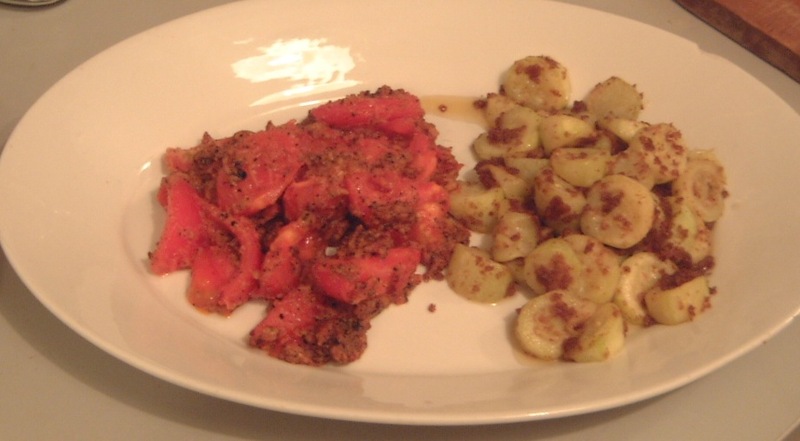 Fried Tomatoes and Courgettes from the pages of "Elsie de Wolfe's Recipes for Successful Dining". The slightly chipped white platter is vintage ironstone. Breading vegetables is something I find rather odd. I much prefer vegetables as close to their natural state as possible—simple, direct, and tasting of the garden. The decorator and hostess Elsie de Wolfe seems to have been of similar mind, given the relatively uncomplicated vegetable dishes featured in her cookery book, Elsie de Wolfe’s Recipes for Successful Dining (William-Frederick Press, 1947). One extremely basic side dish from its pages is Fried Tomatoes and Courgettes (that’s zucchinis to those of us living in the United States). The vegetables are lightly breaded and end up looking a bit messy when cooked as directed but the untidy result is admirable, the bread crumbs adding a satisfying crunchiness that marries well with the tender tomatoes and courgettes. De Wolfe’s cookery book directs that the vegetables be mixed and cooked together; we decided that would be unattractive, so chose to cook them separately and combine them on the plates at serving time. It just looks nicer, I think. First, remove the skins of the tomatoes. Do this by cutting Xs into the bottoms of the tomatoes and then immersing them in a pot of boiling water for 15 seconds. With a slotted spoon transfer them to a bowl of cold water. When cool enough to handle peel off the skins, starting at the X, and slice the tomatoes in pieces the shape of orange sections (not rounds). Set aside. Peel the courgettes and cut into slices of the same shape as the tomatoes. Set aside. Roll or gently toss the courgettes and tomatoes in fresh bread crumbs seasoned well with salt and pepper. Fry in plenty of butter until well done. 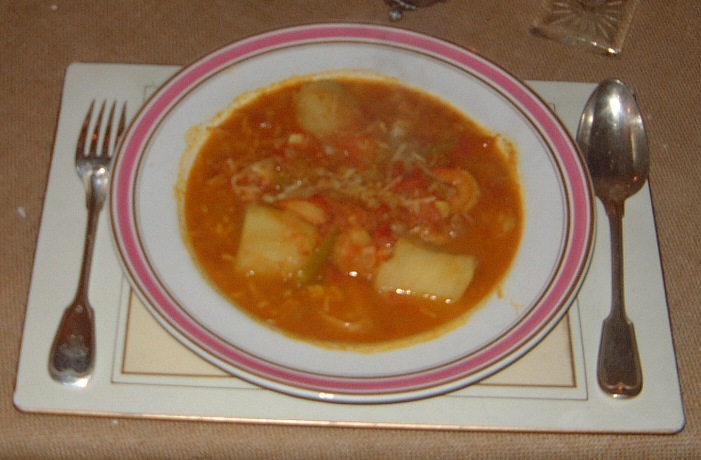 A shrimp-and-potato curry from the pages of "Curries of India", a 1955 British cookery book. The rim soup bowl is 19th-century German; the silver is Chinon by Christofle. Who doesn’t like curry? This Indian standard is healthy, exotic, and escapist. Plus most recipes are blissfully easy to prepare, with only a few unusual ingredients here and there. Strangely, however, my husband and I have never enthusiastically explored making Indian cuisine at home, even though the ceiling-high ladder holding the majority of our cookery books contains a few volumes about subcontinental fare, including Curries of India by Harvey Day and Sarojini Mudnani (Nicholas Kaye, 1955). Curries of India is a slender, deeply charming publication, from its orange-and-yellow jacket to the jolly illustrations. The chapter headings are delightful too, especially the last, “Those Alarming Side Dishes.” Clearly Indian food was still a curiosity in the United Kingdom of the 1950s, at least to some degree. Day seems to have been a devoté, however, with several curry-recipe compilations under his belt. As for his co-author, Mudnani, I have learned nothing. Could someone enlighten me about that individual’s career? Recently we have been entranced by Curries of India and have made a few of the recipes therein. All have been toothsome and big hits within our family; even our eight-year-old daughter, Catherine, has left the table with only praise. The curry pictured above is Aloo Kolbi, composed of gently simmered shrimp, coconut, chilies, and tomatoes. Try it; you’ll like it. You might want to ramp up the spices though; I found it just the tiniest bit bland, probably the authors’ being considerate of sensitive British palates. Brown onions and garlic in the fat [we used olive oil] and put in tomatoes. Add a cup of water and all the spices except the coconut. Salt and simmer for 4 minutes. Add potatoes, chilies, and shrimps and cook until the potatoes are done [in other words, fork-tender but not squishy]. Add the coconut, stir, simmer gently and serve. Pulled and Grilled Chicken, one of the culinary specialties served in the 1920s and 1930s at Polesden Lacey, the country house of British hostess Mrs Ronald Greville. That being said, the mondaine Mrs Ronald Greville, wife of one of Edward VII’s best friends, was a superb hostess, greeting the high and mighty in the sumptuous rooms of Polesden Lacey, which had been decorated in high-Edwardian Francophile style by the architects of the Paris Ritz. Very often what was served on milady’s Sèvres porcelain, while she herself was swathed in a necklace that once belonged to Marie Antoinette, was a slightly complicated but tremendously pleasing chicken dish, Pulled and Grilled Chicken. How complicated? Though it really isn’t that difficult to produce, let’s just say I won’t be making this every week by any means. 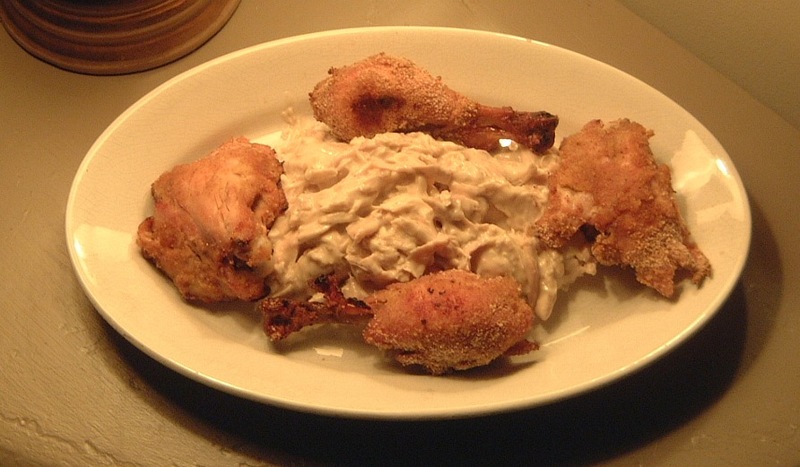 But its combination of devilled dark meat and velouté-sauced white meat was delectable and surprising. 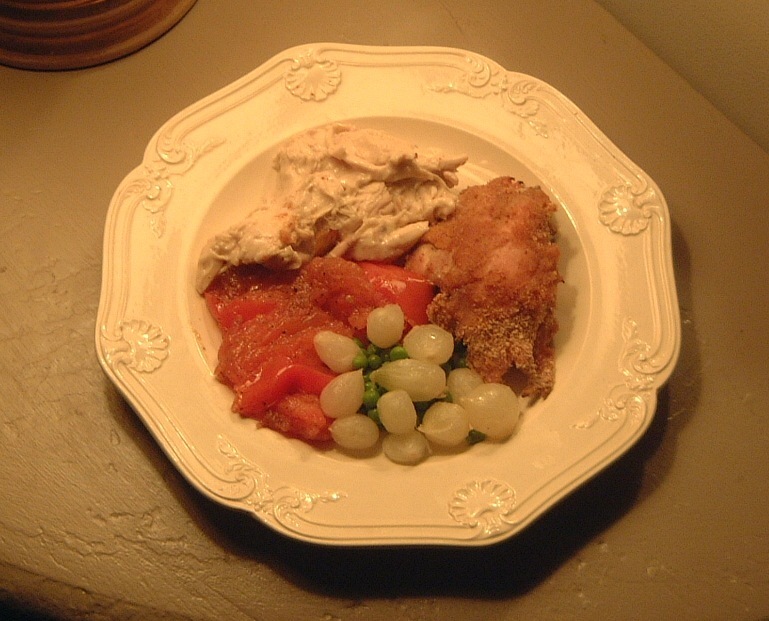 Mrs. Greville’s pulled and grilled chicken, plated on old Wedgwood, and served with tomatoes and a medley of pearl onions and green peas. Make the velouté sauce by mixing all the ingredients together in a sauce pan. using some of the chicken stock if you have boiled the chicken. (If you choose to roast it, make a little stock in advance from the neck, wing tips, et cetera. You only need 7 fluid ounces.) Place the pan on the stove, over a low heat and stir frequently. Keep the sauce warm while you devil the brown meat. Make the devil mixture: mix the chutney with the two mustards and the Worcestershire sauce. Make small slits in the outside of the brown-meat joints, through the skin, and rub all over with the devil mixture, then coat with crumbs. Dot with tiny bits of butter and [roast in preheated oven] until golden brown, turning to colour evenly. To serve, stir the pulled meat into the velouté sauce and reheat [gently until relatively hot; use your judgement on this]. Pour into the center of a shallow dish and lay the grilled joints around the edge. Barbecued Chicken à la Mrs James Young. It looks an axe murder but trust me—it truly is delicious. 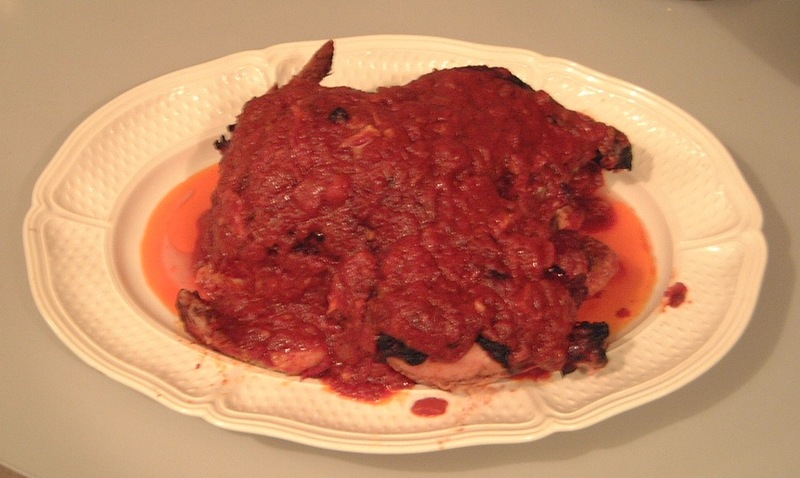 But the chicken should have been carved before the sauce was poured over it. Back in the 1960s the wife of eminent soldier-diplomat Sir Fitzroy Maclean, a spectacularly lovely woman named Veronica (1920-2005), published Lady Maclean’s Cook Book (Collins, 1965), a classic which I have dipped into from time to time. Charmingly illustrated with woodcuts and simulacrums of aristocratic notepaper, its 234 pages contained a compilation of typed and handwritten recipes contributed by Lady Maclean and her friends, a heady crew ranging from Nancy Lancester (Nettle Soup) to Pandora Astor (Pâtés Vertes, Watercress Soup) to the Duchess of Devonshire (Chocolate Cake) to Lady Birley (Devilled Sardines). Even Elizabeth David, the woman who changed British cookery with her adventuresome tastebuds and matchless joie de vivre, was part of the bunch, as was Sir Fitzroy, whose offerings included a fantastic hot pudding called Whisky Bananas. One individual who supplied recipes for many favourite dishes was Phyllis Young, wife of Colonel James Young of the Argyll and Sutherland Highlanders; they owned The Portsonachan Hotel near the village of Dalmally in Argyllshire, Scotland. I haven’t tried all her entries but Mrs. Young’s Barbecued Chicken is delectable, even if our production of it looks a bit messy as seen in the photograph above. The introduction to the recipe is charmingly practical: “We find this a good way of roasting chicken which has been deep frozen and is rather lacking in flavour.” Sign me up—what store-bought chicken doesn’t share these characteristics? We turned the leftover meat into a chicken salad for the next day’s luncheon, binding it with a bit of mayonnaise and mixing in thinly slice celery and a dash of fennel seeds. The leftover sauce was added to the chicken bones, mixed with water, and turned into a broth for risotto. Chop onion finely and sauté in the butter, then add garlic, and all the liquids. Cook for half an hour [over a low to medium heat] and strain. Carve the chicken and arrange on a platter. Skim fat from the sauce and reduce a little on top of the stove. When thickened pour over the carved chicken and serve.